Knowing the best paintball gear for beginners can be a daunting task. There are hundreds of options when it comes to paintball masks, markers and air tanks. As a new player, you want to make sure you get the best paintball equipment for your money. The last thing you want is to buy a piece of equipment that won’t hold up. As the largest paintball store in Minnesota’s Twin Cities, we know paintball gear. Here are our tips for choosing the best paintball gear for beginners. Sure, you can rent a paintball marker at your local paintball field, but it’s just not the same as having your own marker. Owning a marker gives you the opportunity to customize it for your needs. Don’t break the bank on your first paintball marker. If you’re like most paintball players, you’ll wind up buying another one down the road. If you want the best paintball gear for a beginner, choose a marker that is durable and doesn’t require much maintenance. If there’s one item worth every dollar you spend on it, it’s your paintball mask. You’ll be wearing your mask all day, so it’s important to find one that’s comfortable on your face, has a good airflow, and doesn’t inhibit your hearing. Visit your local paintball pro shop and try on masks. Trying on paintball masks is the only way to find one that will fit you well. Most importantly, you want to find a safe mask. Paintballs travel at over 200 MPH and can do catastrophic damage to your eye. Fogging can be an issue on humid or cold days. A thermal lens is worth the extra money and is your best chance at conquering Minnesota paintball weather. The air tank is the power source for your paintball marker. There are two types of paintball air tanks–CO2 tanks and compressed air tanks. While CO2 tanks are much cheaper than compressed air tanks, not all paintball markers are compatible with CO2. 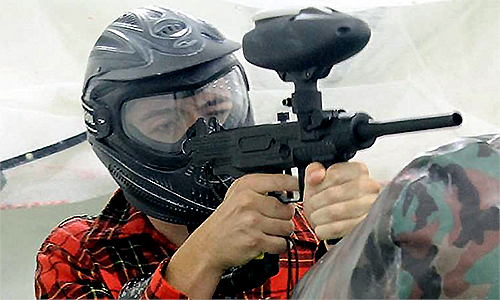 Most high-end paintball markers require a compressed air tank. The good news is compressed air tanks are compatible with nearly all paintball markers. They’re also very durable and can last up to 15 years. The regulators are repairable and replaceable, so you don’t have to worry about your tank becoming obsolete. By far the most popular paintball air tank is a 68 cubic inch, 4500 psi tank. It’s worth spending the extra money for a good compressed air tank, if you have the money to spend. Have questions about the best paintball gear for beginners? Swing by our paintball pro shop in Minneapolis. We have the largest selection in Minnesota’s Twin Cities. Our staff are MN’s paintball professionals and love to help new players find the best paintball gear.